The internet’s role in facilitating people’s choice to engage in personal or professional learning hinges to some degree on the tech assets they have. As Pew Research Center has reported, two-thirds of Americans have a smartphone (68%) and another two-thirds have a home broadband connection (67%). One measure of persistent connectivity is whether people have both a smartphone and a home broadband connection. In the October-November 2015 survey, 56% of adults report having both. This turns out to be a good metric for analyzing the association between tech assets and learning among adults. There is nearly a 20 percentage-point difference in the incidence of personal learning in the past 12 months between those who have both smartphones and home broadband and those who have one but not both kinds of connectivity. The gap is even greater than that for those with neither smartphones nor home broadband connections (19% of all adults). 82% of those with smartphones and home high-speed connections have done some sort of personal learning. 64% without just one of those tech assets have done some sort of personal learning in the past year. 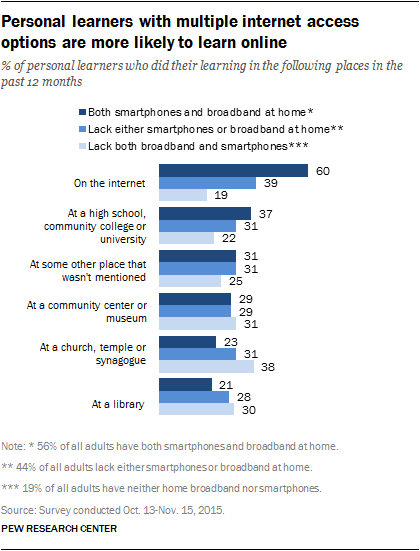 54% of those with neither home broadband connections nor smartphones. The differences in internet access also show up when looking at the places adults undertake their personal learning activities. When asked how much of their personal learning they do on the internet, personal learners with smartphones and broadband connections at home are far more likely to rely on the internet than those lacking at least one of those. 69% of those with both home broadband connections and smartphones have done some sort of learning for professional or job-related reasons in the past year. 51% of those who have either home broadband or smartphones, but not both, have engaged in some professional learning in the past year. 41% of those who lack both broadband and smartphones have engaged in some professional learning in the past year. The places where professional learners got their extra training also are associated with the kinds of technology tools people have. More tech access means greater reliance on the internet for training, as well as training offsite from the workplace or at conventions. 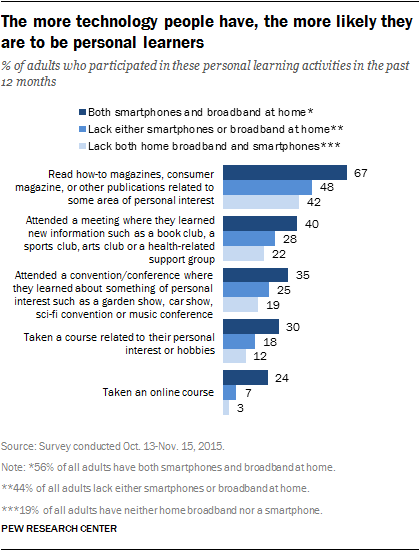 There are too few cases to present findings on those with low levels of tech access (i.e., they lack smartphones or home broadband connections), but a general pattern shows that professional learners who lack home broadband and smartphones are a bit more reliant on community institutions, such as libraries, for training and less likely to attend conventions or use the internet for professional training. And, much like the case for personal learning, tech access shapes how heavily adults use the internet for professional learning. More than one-third of professional learners with lots of tech assets say they did all or most of their learning online, while about one-fifth with fewer options for online access say this.